Article on Training is explained as train in the cycling season, first you have to set the year and set the stage with the preseason. This period of general physical preparation is a propitious time for exercise and sports as specific complement the work that has been developed and will be developed with cycling. In this period in Europe, in the northern hemisphere autumn and winter begins, just cycling season, less fancy cycling, very cold, starts to be little light, there is little activity Competitions. It is a propitious time, all these factors, to get off a little bicycle, to perform other exercises and other sports: football, basketball, swimming, skiing, foot race, skating, etc.. we can do what we could not do before because of lack of adaptation to the environment. It also coincides with a period in which we must use to acquire a much better overall fitness, doing gym work loads and outdoor, as discussed below, we will then serve to improve performance as a cyclist. Adaptation to climate: jobs where the winter weather does not impact so negatively as the cycling. To do this I am going to design a simple way of working with the distribution of the type and intensity of the research in preseason. We must have a working method that starts with a good extended heating with various physical exercises. Work force of the legs with multihop, weight for better cycling characteristics, Fitness and performing in the works of other muscle groups that will help us avoid injury and maintain offset other muscle groups not working too in cycling. Cardiovascular basically do the jobs with career days alternating walking with the bike to keep the feel of the bike and spend one day a week at least to swimming. Heating: lasts an average of about 30 a 50 minutes, depending on the time and encourage you to have. You must make derotaciones static exercises and elasticity, alternating with motion, accelerations, varied multisaltos, etc., intercalándolos general warming mode. Gymnastics Circuits: biceps, Triceps, pectoral, abdominal, lumbar and multihop. They will be in the gym or on the field after the foregoing warming. Realization: You must insert the exercises so you do not repeat the same two exercises muscle area and must recover between each exercise ( of 1 a 2 minutes) and, anything else, between each full circuit (5 minutes, making walking and stretching). If you do in a gym in the afternoon, separated from other work, there is an attempt to correct you monitor you design a routine according to the equipment available globally and all muscle groups involved in work force-resisting 15 a 20 repetitions of a resistance no greater than 50% the maximum load that can move in a single repetition, with particular emphasis on the abdominal waist and arms (biceps-triceps-chest) The legs work the ideal for cycling shape with multihop, outdoor, soft sites. The arms: biceps, triceps and pectorals. These are simple exercises are best performed with the corresponding equipment at the gym. The waist circumference: abdominal, always folding legs. Lumbar, without passing the horizontal, must not arch the spine in the lower back and that cycling causes excessive arch in the lower back, lordosis, and vice versa for the top of the column being arched outward (Chepa), cifosis. Both alterations, We must counter them with appropriate exercises and do not affect their increase, and that over time we might have a serious problem of sciatica. Legs: recommend the multihop, before the gym equipment for cycling. The multihop are natural exercises performed with your own body weight at a rate of reaction, relatively fast, that is closer to that cadence slow repetitions of the machines at the gym. Develop a mix of hard-power-endurance cyclist for more accurate loads with equipment in gym. 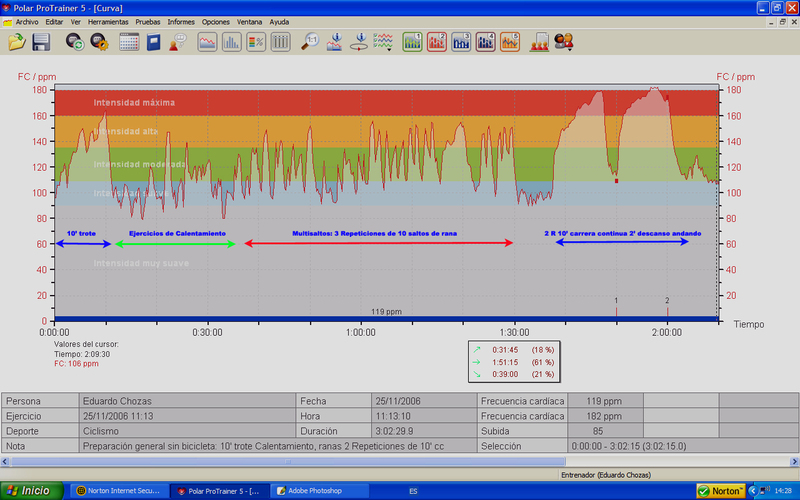 Race continues (cc): consists of running on foot at about the anaerobic threshold intensity (F= 80-90 % pul/máx), for as long as the program mark, also marked the recovery will take walk (not stopped) It is very important for those who do not be the habit of running on foot throughout the year that do not run over 10 minutes at, as, the joints of the legs are not adapted, ye may resent the knees and ankles. Look at the experience of professional cyclists so exclusive that almost none can run on foot for the dedication to cycling, when youth and amateur, if they could run. For it is very important that each 10 minutes of running the recovery is of 2 minutes walking, as, relaxes tensions and accumulated charges in the muscles and joints. If you run a physical problem gives you can make this work with other sports: cycling, skating, skiing, swimming, etc.. … This work keeps the cardiovascular system to a level acceptable to not start from scratch with bicycle. It is ideal in these very cold winter periods, in areas of continental climate as it is most except Spain and the Mediterranean islands. Certainly, who have, great opportunity and, fortunate to have a beach nearby is an ideal site for this work, with the multihop. Multisaltos: The day they touch series must perform multihop, equally, heating and then dedicate yourself to perform the series of 10 jumps in a row. The recovery between each run ten jumps should be allowing you to make the 100% again 10 jumps, you should not start over 120-125 pul/min. Realization: (Frogs) jumps are performed starting from squatting, squatting, feet parallel, separated in a similar position to which the bicycle is, ½ m a foot to another. You have to jump, highest and the farthest, to fall back into the starting position, 10 times in a row. You must jump correctly without wanting to go too fast to support you properly in the drop jump. This exercise is very intense muscularly, the first few times will give shoelaces so you must do so on a trial, with fewer hops one week before. You will greatly improve your strength-power. *2 Repeats 10 F = 80% minutes in / max and 10 Soft minute recovery, running without a load 90 ped/min. Then do 30 minutes L = 60-70% beats / maximum. The work cycle will be sandwiched between the days of general Work, you can also do bike at the end of general work in the section on games as a walk and help you drop legs, if you ride your bike to work point you start the bike and in heating and ultimately helps you recover. Roller: Midweek will be difficult for you to withdraw 2 hours to bike, so that, You can adapt this work perfectly roller exercise concentrating in one hour: (10Cal-4R5'F / 5'S-10'L / 5 S). *10 minute warm, 4 Repeats 5 minutes F = 80% pul / max with 5 minutes of recovery 90 minute time riding without charge. After, 2 Repeats 10 minutes L = 60% pul / max with 5 minutes of mild recovery 90 Barang / min sin carga. Saturdays and Sundays, you can take to make bicycle outdoors with your group of friends. You can change the routes by bike and discover the countryside with mountain biking, spends less cold and need fewer miles to go 2 from 3 hours of bike. Swimming: Note that the water relaxes muscularly and will come to you to release some of the pressure of the lower body and to correct the tension of the spine caused by the position of the entire year on the bike and various other causes. Besides working cardio-vascularly. It is advisable that you do this activity, after a good workload, the end of the week. Working Example: takes a little warming and beam 4 series of 5 'in different styles, gets other 5 minutes including. You can also take a dive as long as possible by staying underwater to increase lung capacity. At 67 years old, considero que debes realizar un entrenamiento dirigido a la salud, sin esforzarte a grandes intensidades, no pasar la zona del umbral anaeróbico y disfrutar de los recorridos que realices en modo Tranquilo, puedes realizar algún ejercicio de fuerza para que la musculatura se mantenga, seriés cortas de 20 segundos que no hacen subir mucho el pulso pero si te mantienen el tono muscular. A esta edad el sistema hormonal va bajando y los ejercicios de fuerza no perjudican al corazón y si mantienen muy bien el tono muscular. I have 54 años y más de 30 montando en bici. No ando mal pero tengo la sensación de que otros compañeros tienen un puntito más, aún entrenando un puntito menos. He hecho un parón invernal sobre la bici de un mes, sin descuidar el mantenimiento muscular y aeróbico. My question is: qué periodo de base y que entreno debo hacer para llegar al me de mayo a pleno rendimiento. HAVE 57 YEARS, HACE DOS AÑOS VOLVÍ A RODAR (fui ciclista por 7 años y de los buenos) y me animé a competir de nuevo…..me encantó volver a competencia……quisiera que me ayudaras por favor con una tabla de entrenamiento …..tengo todo el tiempo para entrenar y quiero mejorar y seguir rodando……he conseguido máquinas de pesas, aunque no las utilizo aún porque quiero saber si es viable y qué ejercicios puedo hacer. Estoy creando un grupo de ciclistas tambien….pero quisiera asesoría para ello. Hello Eduardo, soy un cadete de primer anyo, debo seguir los mismos pasos que das para todos? como seria los otros dias? serian de descanso? como dice dos dias de bici, dos de parte fisica, 3 serian descanso ? thank you very much, tengo otra duda, como planteas los entrenamientos, algunos los elaboran a base de km y otros en base de horas. desde su punto de vista cual es la mejor? Tengo un hijo de 15 just turned years, from the 5 años de edad hace ciclismo; hasta la fecha de manera recreactiva y participando en carreras infantiles locales obteniendo podios normalmente. Siempre, siempre me ha expresado desde pequeño su deseo de ser ciclista profesional; to 11 años empezó rodar en marchas cicloturistas de más de 180 kms. como la Quebrantahuesos América siguiéndoles el paso a los mayores y con 12 años completó la Brevet México-Acapulco de 365 kms y más de 4,720 de desnivel acumulado en poco más de 15 hours. Yo no estoy muy seguro de desear que sea un profesional pues imagino el alto grado de riesgo y el sufrimiento que implica, no me ha sido posible disuadirlo y lo veo tan convencido y causa tal asombro entre los ciclistas y triatletas que lo ven que me siento presionado a apoyarlo y a buscar la manera de que se prepare en otro país pues aquí el sistema no está generando ciclistas de buen nivel España, Italy, Colombia, no lo sé. Desconozco la manera de encaminarlo, de impulsar su deseo. HELLO EDUARDO. HAVE 18 YEARS , LLEVO UN AÑO DE ENTRENAMIENTO Y HE RENDIDO MUY BIEN , QUISIERA SABER QUE VITAMINAS CONSUMIR PARA SER MEJOR CICLISTA Y MANTENER BIEN EL CUERPO PARA EL ESFUERZO , YA QUE NUNCA HE CONSUMIDO VITAMINAS ARTIFICIALES, , SOLO LO QUE COMO NORMALMENTE, ME GUSTARIA QUE ME ACONSEJARAS UNAS BUENAS VITAMINAS PARA RENDIR MAS. APROVECHO PARA FELICITARTE Y AGRADECERTE YA QUE GRACIAS A TUS ARTICULOS HE SABIDO LLEVAR MI ENTRENAMIENTO Y HE MEJORADO MI ESTADO DE FORMA. Thank you very much , ESPERO TUS CONSEJOS. Hola Eduardo, en la pretemporada es correcto alternar un dia en gimnasio (rutina variada segun corresponda tronco inferior o superior) y otro dia en bici (con las frecuencias y tiempo que recomiendas) y para los fines de semana salidas de paseo con el grupo o solo pero nada intenso?. Thank you very much Eduardo…..
As advised to the break between seasons. It coup for cycling or reduce hours to 0h? It should continue or should stop riding entirely cycling and doing other things? Few week break is recommended? He stands and is, because with active rest a transition month is always done, then begins with the preseason, article that you can read and perform, perhaps it is the most important part of the season, work force is essential at this time. very good Eduardo, I am disabled cyclist, task en Tanden, I spent a year going in for competition of such tests by my visual impairment, obtaining excellent results when taking into account that training of this modality has been rather little, luck is that I have good visual rest and can train individually. Hello Eduardo… que tiempo aconseja usted que dure la pretemporada? Hello Eduardo, en el plan de entreno, durante la semana (siete dias), que dias de descanso aconsejarias hacer… siempre contando que el domingo sales con la grupeta. Hello, Eduardo unas pregunta, el entrenamiento se hace a un 70 u 80% del máximo? Hello in the case of train with bicycle, exercises to perform many days a week would be advisable, not counting the weekend because when you go with the group is very difficult to control the pulsations, always go high, this situation is advisable to put perjudical or even keystrokes 90% in some ports 30 minutes. One, solo tienes que ajustar tus capacidades, tus zonas de umbral anaeróbico y tus capacidades de recuperar. Para ello deberás quitar en un principio cargas y cuando estés en una buena forma lo podrás realizar perfectamente. Si sigues la pauta desde el principio no tendrás problema, pero tienes que saber las zonas de trabajo realizando algún tes de esfuerzo para orientarte. I want to start in the mountain bike , in late May ay a race for novices to which I want to asist and compete for something, I would like to guide me or if they had a training plan to follow, prior to a lot of sport, of all types and condition but felt he had already practiced last year and no nothing, I'm out of condition, and hopefully I can help. and I decided to start again almost from scratch but eager. Hello ,megustaria seber si haces entrenamientos personales.